Potrete rilassarvi sulla terrazza con vista panoramica Penobscot Bay e guardare le navi mercantili, golette e barche aragosta passano. La casa si trova a 1/2 miglio dal centro di Searsport, facilmente raggiungibile a piedi. Ottima posizione per gite di un giorno, una panoramica un'ora di auto da Bar Harbor e Acadia National Park. 28 miglia a Bangor Airport, 2 ore a Portland. Questo 3 BR 2. 5 casa di bagno ha una rampa per l'accesso di handicap. Il ponte superiore privato è un posto meraviglioso dove sedersi e osservare le navi nella baia. House ha una cucina completamente attrezzata con zona pranzo, aperta sul soggiorno. Il livello principale ha bagno completo e camera da letto principale con letto matrimoniale. Il secondo piano ha 2 camere da letto di grandi dimensioni: 1 con letto matrimoniale e vista sulla baia, il secondo piano BR ha 2 gemelli; 2 ° piano ha anche ampio bagno completo con vanità, vasca / doccia e vista sulla baia. Il seminterrato di sciopero ha una sala giochi con tavolo da biliardo, mezzo bagno, accesso al grande cortile, piscina con sdraio e ingresso separato. Well we just completed our 3rd straight September and are looking forward to our 4th at this wonderful location. Nat and Dorothy could not be more gracious to us. We feel as though we are now " locals" as we arrive each Labor Day weekend for a beautiful month of the peace and quiet of Searsport and Penobscot Bay. We spend our winters anticipating our time in Maine. Having dinner on the deck after an afternoon in the pool, walking in the state parks or exploring Belfast, Bar Harbor and Camden. The house is always impeccably clean when we arrive and everything is in top working order. I honestly cannot over emphasize how nice it is for us. We have travels many, many miles in our lives but This is our favorite place to just chill out for a month and enjoy the Bay and the wonderful weather. We rented this home for a month and really hated to leave. It's was a wonderful time enjoying the pool in the afternoon and the deck in the evening overlooking the bay. The home has plenty of room and is well equipped with all you will need. Nat was a wonderful man to work with and goes out of his way to accommodate you. Searsport is a small, friendly town that is just the right location from Camden and Bar Harbor as well as a 40 minute drive to Bangor if necessary. We look forward to returning shortly. The previous reviews say it all--the pictures of the home represent it exactly. The house was comfortable for the six of us--4 adults and two teenagers. We all enjoyed the pool, pool table & tv. The kids enjoyed the internet access. We enjoyed the easy access to local attractions, Bar Harbor, Freeport & Camden and the beautiful Maine coast. There were several local restaurants in Searsport & Belfast as well as those we visited in Camden & Bar Harbor. We loved having the opportunity to cook lobsters at the house as well, thanks to recommendations from our fine hosts. The location was so peaceful & the view of the bay was wonderful & relaxing. This home is very comfortable with all the amenities and beautiful location that you could easily stay home & not do any sightseeing. We were very pleased with our stay and would definitely be interested in returning to this home. Nat & Dot were very pleasant & informative hosts. We enjoyed their beautiful home as well as getting to know these kind people. Very pleased with our visit to Maine! This spacious and comfortable house truly felt like our home away from home. 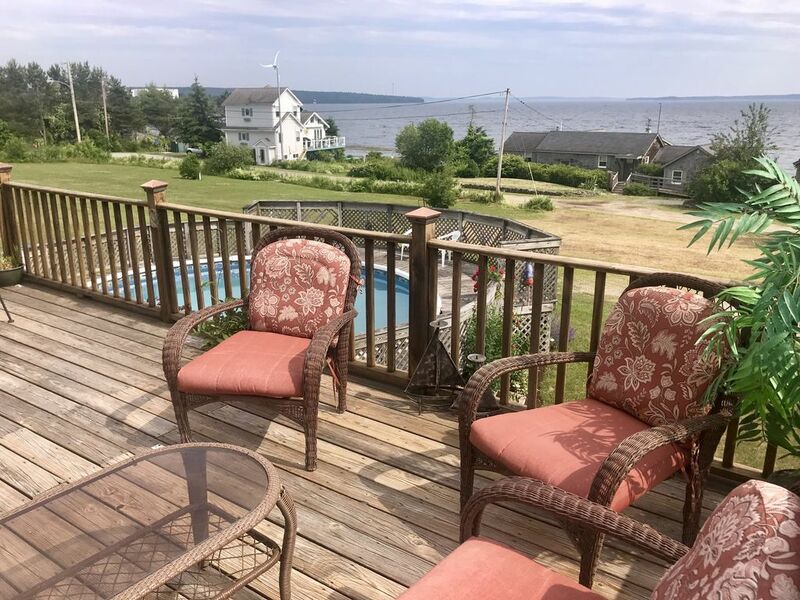 The house has everything a visitor could want or need including roomy bedrooms, a well-accessorized kitchen, a washer and dryer, games, plenty of hot water, and a beautiful deck with a fabulous view of the bay. While it was still a little cold to use the pool, we did walk down to the rocky shoreline to search for rocks and to look for small creatures that might be lingering in the tide pools. The whole area was very rugged and beautiful. From Searsport, we meandered off in all directions. Acadia National Park, Camden, Stonington, and even Freeport were all easy day trips from this central location. After a long day of sightseeing, we knew that we would be returning to a relaxing and peaceful spot. In addition, not only was Nat a generous and easy to communicate with host, but the house was a great bargain for the price. The previous review really says it all. We stayed here a week last year and two separate weeks this year. This house is so pleasant, comfortable, and clean. The photos on the web site represent it exactly. It is so peaceful and does have great views of Penobscot Bay. The location is great. We can take our daily walks to town and the pier with our dog, and then get in the car and explore the beautiful coast of Maine. We can dine out at a favorite restaurant we found, or pick up lobsters at the nearby lobster pound and cook them at the house. So glad we discovered this place and hope to return next year. The house was all & more than we had hoped for...definitely plenty of room for my family of four. It was very clean, and had a great New England charm that really made it feel like home. The location was even better, great view of the bay, quiet, very relaxing. Excellent location for day trips to Bar Harbor, Camden, & a number of State Parks. My teenage children were entertained with the pool table, above ground pool, satelite TV, and internet access....they hardly missed a beat from being away from home! All of us are already talking about when we can go back!! Searsport è noto per il Museo marino di Penobscot a circa 1/4 miglia di distanza, molti negozi di antiquariato, Searsport Pines Golf Course (3 miglia). Facile accesso a Acadia, Bar Harbor e altre gite di un giorno. Favoloso fogliame del New England in autunno.